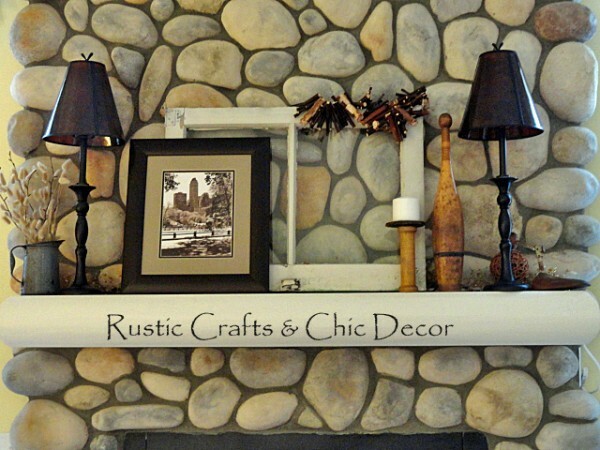 A fireplace mantel is a perfect place to showcase some of your collections and vintage items, antiques and even things considered “old junk” look especially warm and nostalgic when displayed effectively on your mantel. This is popular with rustic decorating, a shabby chic look or when you just want to blend in some of the past with your more modern decor. Since a fireplace is a focal point and a cozy place to gather for warmth and conversation, it makes sense that it is a popular place to also show off vintage accessories. Not only are they conducive to the warm atmosphere but they also tend to bring about conversation. I just went through the process of changing up one of my fireplace mantels…once again…and this time cozied it up with several vintage items that I had just purchased. I love mixing the old with the new! 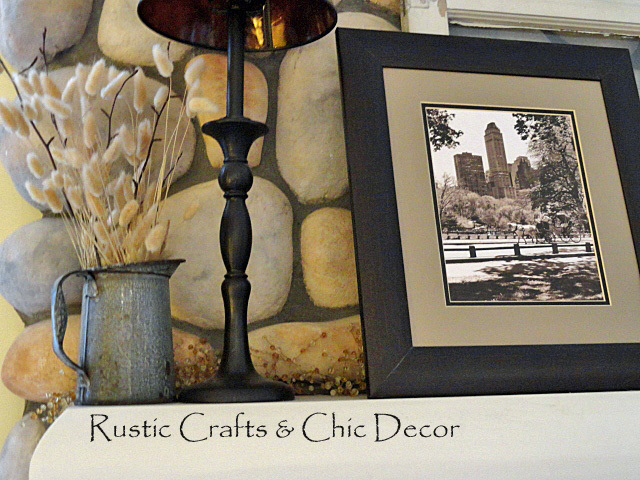 The two lamps and my favorite Central Park picture have pretty much been staples on the mantel which I decorate around. I try to vary the colors in each grouping so that I don’t have a bunch of dark browns all clumped together and all the light colors in another group. Usually, I arrange and rearrange until I’m happy with the scattering of colors and sizes of the different objects. Texture is important to me too. I like a nice variety to really enhance a grouping. This part was fun! I added texture to the top of the window by draping some of my birch branch garland over the top. As you can see from the mantel top, some of the bark flaked off while I was doing the draping which of course I noticed after taking the picture! It just adds to the rustic-ness don’t you think! I made a candle holder from a vintage bobbin and a pine coaster – such a quick and simple re-purpose! My father in law gave us the next item. Can you guess what it is? 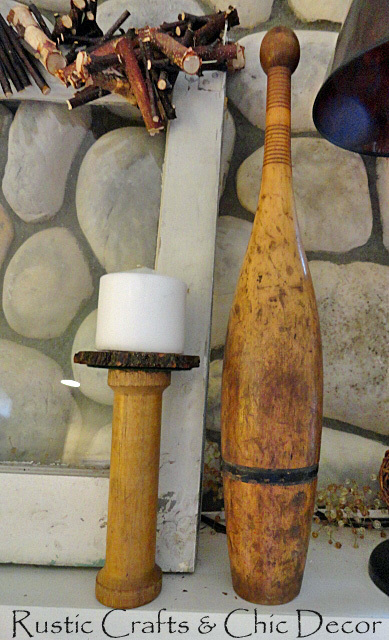 I thought it was an old bowling pin at first. It is actually a primitive weight for exercising! 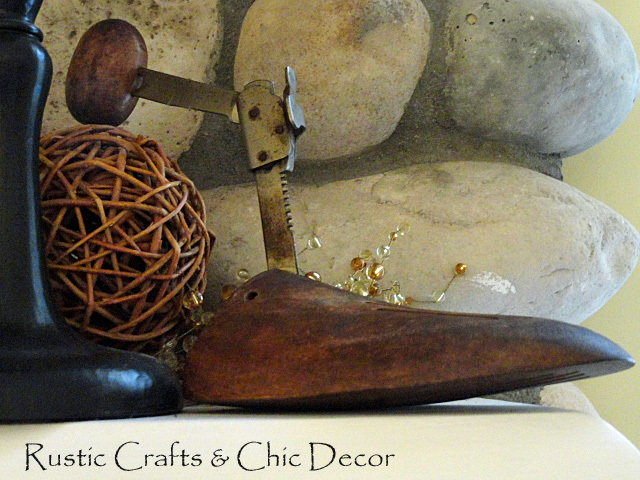 This old wooden shoe form adds some fun rustic whimsy to the mantel…..at least until I sell it! Then it will be back to the drawing board. But, that is half the fun of collecting! Notice the ball the shoe is leaning on and the texture it adds. You and I have the same taste in decor…we both love to mix things up with vintage to create an interesting and eye-catching appeal. 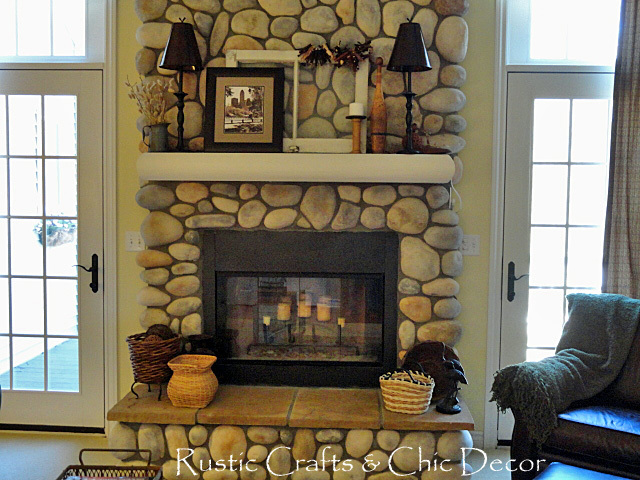 I love your mantel choices! Isn’t it great to love what you do?